Anarchists protested the shooting of two African-American shoplifting suspects by a white Olympia officer. Police and public officials promised a thorough and unbiased investigation into Thursday’s early-morning shooting. 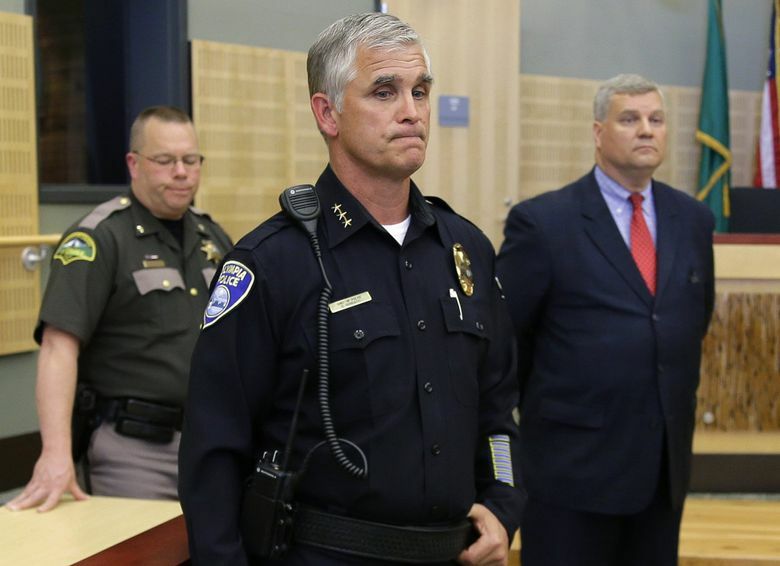 OLYMPIA — Police and public officials urged civility while promising a thorough and unbiased investigation into Thursday’s early-morning shooting of two African-American shoplifting suspects by a white officer. Police and Olympia Mayor Stephen Buxbaum provided little information about the confrontation except to say there was no early evidence that race was a factor in the shooting. They also warned it could be weeks before the investigation is completed. Despite the call for calm, the evening ended with a violent confrontation between protesters and police. Officers eventually dispersed the crowd with flash-bangs and protesters responded by throwing rocks before leaving the area. No injuries were reported. Demonstrations earlier in the evening had remained peaceful. The two shoplifting suspects were identified as stepbrothers Bryson Tyler Chaplin, 21, and Andre Damon Thompson, 24, both of Olympia. Chaplin was upgraded Friday from critical to serious condition at Seattle’s Harborview Medical Center. Thompson was in serious condition at Tacoma General Hospital. Both are expected to live, said Chief Deputy Brad Watkins of the Thurston County Sheriff’s Office, which is heading the four-agency task force investigating the shooting. Neither man was armed with a firearm, according to police. The officer who shot the men, Ryan Donald, reported by radio that he had been assaulted with a skateboard during an encounter with Chaplin and Thompson on a darkened street. Watkins said Donald was not injured. Donald, 35, a three-year Olympia Police Department veteran, has been placed on administrative leave, which is routine after a police shooting. Donald was one of several officers who responded to a shoplifting call at the Westside Safeway store shortly before 1 a.m. Thursday. Employees reported two men with skateboards had tried to steal beer and, when confronted, threw the beer at the employees and fled, according to police. Donald stopped two suspects a short distance from the supermarket and “a few minutes later, the officer notified dispatch that he had been involved in a shooting,” the department said in a news release. Watkins said detectives have interviewed two witnesses who were driving by and saw the officer with his firearm drawn. “They said they saw another man advancing aggressively toward the officer,” he said. The couple did not stop and did not see the shooting, he said. Detectives also interviewed Thompson in the hospital, but Watkins said during a news conference that he did not know how his version of events squared with the officer’s. Donald gave a preliminary statement to other officers at the scene, but has not been formally interviewed by detectives in keeping with task-force protocol, Watkins said. That should happen Tuesday, he said. Watkins said detectives recovered shell casings from two spots, and police said there were apparently two separate altercations — one near Donald’s patrol car, where the department said Donald was first attacked. The second occurred nearby at the edge of a copse of woods where the men fled after the initial shots were fired, Watkins said. Police said the men came out of the woods and confronted the officer. “We don’t really know what happened there yet,” Watkins said. In radio calls released by police, Donald calls dispatchers after spotting one of the men, and again after he had apparently shot one of them. Donald then reports he has one man, then both, at gunpoint and asks for backup. Seconds later, he reports “Shots fired. One down,” and again asks for additional officers. Then, he reports the second man had been shot. Olympia Police Chief Ronnie Roberts said an officer “has the right to defend himself” against an attack with an object that could be used as a deadly weapon. Watkins said the initial confrontation with Safeway employees was caught on security camera. However, there is no dashboard camera or audio recording of the encounter between Donald and the two young men. Yauger Park, which includes a skatepark, is directly behind the Safeway store. Two young men at the park Thursday afternoon, who didn’t want to give their names, said they had been drinking beer at the park with Chaplin and Thompson until about 11 p.m. Wednesday when the group left. Crystal Chaplin and Jasmine Thompson, of Olympia, mother and sister of the two wounded men, said they believe the shooting was the result of mistaken identity, according to The Olympian newspaper. Chaplin said she doesn’t believe her sons would shoplift. Andre Thompson’s criminal history includes guilty pleas in Clark County District Court to supplying liquor to a minor, minor in possession of alcohol and bail jumping in 2012, according to court records. In another case, the same year, he pleaded guilty in Clark County to obstructing a law-enforcement officer while a third-degree theft charge was dismissed. In 2013, he was cited in Tumwater, Thurston County, for operating a motor vehicle without a valid license and having no valid operator license. In April, he was ticketed in Lewis County for failure to wear a safety belt. Bryson Chaplin’s criminal history includes a 2012 guilty plea in Clark County Superior Court to taking a motor vehicle without permission, according to court records. He also has an extensive juvenile-court record in Clark County, including guilty pleas for second-degree robbery, taking a motor vehicle without permission, theft and assault. Thurston County Prosecutor Jon Tunheim said he has assigned someone to the police-task force investigating the shooting. Tunheim said he will decide, after the facts are gathered, whether criminal charges should be filed. He acknowledged his office works closely with all the agencies involved in the task force, but does not believe that poses a conflict of interest — an issue raised in the investigations into other high-profile police shootings, including the death of Antonio Zambrano-Montes in Pasco in February. Tunheim said the Washington law that applies to the use of deadly force by police poses a “fairly high standard” for prosecution. Officers must be shown to have acted both with bad faith and with malice to be convicted, he said. “I have every confidence this is going to be very thorough investigation,” he said. City officials moved early to try to blunt any public backlash to the shootings, which come amid a national outcry and protests over the deaths of unarmed black men at the hands of police, including Freddie Gray in Baltimore; Michael Brown in Ferguson, Mo. ; Eric Garner on Staten Island, N.Y.; and 12-year-old Tamir Rice in Cleveland. The city has set up a special webpage for updates on the shooting and held two media briefings Thursday, the first one only hours after the shooting. More than 125 people gathered Thursday evening downtown at the Temple Beth Hatfiloh to share how they felt about the shooting. Several residents took turns calling for a wholly independent investigation of the shooting, as well as more citizen oversight in general of police. Reuben Yancey, a 62-year-old retiree, told those gathered that he didn’t believe the shooting would have taken place if the men had been white. “The racial aspect of it can’t be avoided,” said Yancey. Only two of the Olympia Police Department’s 68 police officers are black. Around 7 p.m., a crowd of several hundred that had gathered at a park began marching. Carrying signs with the names of Chaplin and Thompson and slogans such as “disarm the police,” they marched on Harrison Avenue downtown. But in shooting them, “The officer didn’t do the right thing,” he said. Earlier, Mayor Buxbaum urged public calm and praised those citizens who gathered Thursday at several small protests outside Olympia City Hall for respecting the peace. “Our community is a strong, caring and compassionate community. We deeply value nonviolence and justice that is restorative. This is a challenging time that I know we will move through together, learn from and be stronger as a result,” he said.